The “Deutsches Rechtswörterbuch” (DRW, literally: “German legal dictionary”) is the compre­hensive dictionary of historical German and West Germanic legal terms. It thus covers the wide realm where language, law and history meet. Because of the DRW’s encyclopedic tendency, special attention is paid to the semantics of words. Each entry examines a word from its first historical record until the present time, which in some cases spans more than 1400 years. In addition, the dictionary cites historical usage from various regions of the West Germanic language area – from Friesland to Transylvania, from Lorraine to the Baltic States. To capture the full lexical diversity of meanings for each word, the dictionary employs techniques of synchronic and diachronic comparative law in addition to purely linguistic and lexicographic approaches. 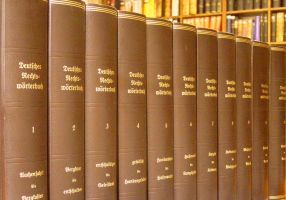 As the most comprehensive dictionary of any German technical vocabulary, the DRW covers all legally relevant German terms from the beginning of Germanic written tradition (about 450 AD) up to 1815 (word occurrences in the online version until 1835) and comprises, in addition to modern German, other Western Germanic languages and language varieties, e.g. Old English, Lombardic, Old Frisian, Middle Dutch and Middle Low German. The "German language", to which – according to the concept of the 19th century – the whole of the West Germanic language family belongs, as Jacob Grimm has laid down in his introduction to the “German dictionary”. ● New High German (from 1650). From the beginning of Germanic writing up to the early 19th century. ● Currently oldest record: “mundburt” from a Merovingian charter of Clovis I, 479 AD. ● Latest year for short references (“Wortbelegung”) online: first occurrence from before end 1835. In addition to specific legal terms such as “Anwalt” (solicitor, barrister), “Kampfgericht” (trial by combat), “Litiskontestation” (official acceptance of a legal complaint by the accused) und “Reichsfriede” (peace of the Holy Roman Empire) the DRW also gives an insight into everyday legal life, as is reflected in words like “Apfelteilung” (splitting of an apple), “brandmarken” (branding), “Gabel” (fork), “melken” (milking), “Nachbar” (neighbour), “rot” (red) und “Schraubenzieher” (turnscrew – as a profession). Over 90,000 main entries in approximately 20,000 columns have been printed so far – in alphabetical order from “Aachenfahrt” (pilgrimage to the coronation church of the Holy Roman Empire at Aachen) to “Schuld” (guilt). Every year more than a thousand new entries are added. The complete work will consist of 16 volumes with about 120,000 main entries. The technical language of law and legally relevant terms in the general language. ● Everyday language with legal implications. The dictionary is created by a team of academics (legal historians, historians, linguists and a philosopher) in interdisciplinary collaboration, working in the “DRW Research Centre” at the “Heidelberg Academy of Sciences”. The corpus of source material includes around 8400 texts (these may be individual historical legislations or whole journals). This corpus is accessed through an archive of more than 2.5 million index cards and a full text database, which is being expanded continuously. Even in 1897, as work at the DRW began, lawyers, linguists and historians were equally involved. As the dictionary entries provide a colourful insight into Central European linguistic, legal and cultural history, there are users from almost all historically oriented disciplines, such as onomastics (study of names), numismatics (study of coins), history of medicine, theology, linguistics, social science, history of women, political science, local history, agricultural science, history of economics and historical geography. The free online version (www.deutsches-rechtswoerterbuch.de) enables an easy global open access. Andreas Deutsch, The “Dictionary of Historical German Legal Terms” and its European concept, in: Charlotte Brewer (ed. ), The Fifth International Conference on Historical Lexicography and Lexicology (ICHLL5), Oxford University Research Archive (ORA), http://ora.ox.ac.uk/objects/uuid:ef5d07d3-77fc-4f07-b13f-d4c24b4d1848, 2011.